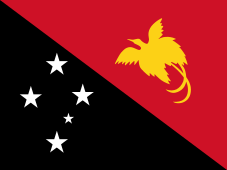 Papua New Guinea (PNG) is located on the eastern half of the island of New Guinea and is 160 km north of Australia. PNG comprises both the mainland and some 600 offshore islands. It has a total land area of 462,840 km², including the large islands of New Britain, New Ireland, Bougainville, and hundreds of smaller islands. Papua New Guinea is mostly mountainous and covered by tropical rainforests, as well as supporting very large wetland areas surrounding the Sepik and Fly rivers. PNG is surrounded by coral reefs. It is located on the Pacific Ring of Fire, at a point of collision of several tectonic plates. There are a number of active volcanoes present, and eruptions are fairly frequent. Earthquakes are also relatively common, sometimes accompanied by tsunamis. The mainland of the country is the eastern half of New Guinea island, where the largest towns are also located, including the capital Port Moresby and Lae. PNG has a moderate tropical climate with high levels of seasonal rainfall. In the highlands, temperatures can range from a low of 4°C to a high of 32°C. The lowland, coastal, and island areas have an average daily temperature of 27°C. PNG's population is about six and a half million people. Around 18 percent of the population live in the ten major urban areas. The major city and capital of the country is Port Moresby with a population of around 500,000. Other important towns and cities include Lae, Madang, Mt. Hagen, Wewak and Goroka. The population of Papua New Guinea is generally quite young, with 39 percent between the ages of 0-14, 58 percent between the ages of 15-64, and only 3 percent over the age of 64. Papua New Guineans, most of whom are Melanesians, vary widely in their physical characteristics, ethnic backgrounds, and cultural types. PNG is one of the most heterogeneous country in the world. Due to the isolation of most communities in the past, more than 800 different languages have evolved and are still spoken, which accounts for approximately one-third of the languages known in the world. Due to the cultural diversity of the country, English is the language of Government, commerce, and law. English is a compulsory subject in school throughout PNG and, apart from isolated communities, is widely understood. About two-thirds of the population are Christian, with the Catholic and Lutheran churches being the largest denominations. The Papua New Guinean attitude to the land is very different from that of the European. Land is not regarded as a commodity that can be bought and sold by individuals it is a permanent and integral part of a village community. The present "owners" of the land have usage rights only and therefore hold their land in custody for their ancestors and descendants. They can hand over the personal usage rights but they can never sell the land itself. Papua New Guinea is rich in natural resources. There are extensive reserves of natural gas and oil, as well as huge mineral deposits of copper and gold. The agriculture, forestry, fishing, and manufacturing sectors combined still account for a significant portion of the nation's gross domestic product. The major exports are minerals (gold, silver, copper, oil), timber, coffee, palm oil, cocoa, and copra. PNG has experienced an even balance of trade over the years, with exports marginally more than imports. Forest products are one of PNG's major exports, but the timber resources of the country again remains largely untapped. There are 36 million hectares of enclosed forest of which about 15 million ha are high quality tropical hardwoods. Timber operators are currently harvesting only around 1.5 million m³ of the estimated 375-450 million m³ of available timber. The government is mindful of important environmental issues. Each project is carefully monitored in terms of its environmental impact with appropriate solutions to meet needs of local people and investors. The waters around PNG are rich in marine life and are virtually untouched. Within the fisheries zone are large varieties of fish, including migrating schools of tuna. Commercial fishing in the Pacific Ocean accounts for approximate half the world's tuna supplies. In 2008, the development of the Papua New Guinea Liquified Natural Gas (LNG) Project took off. It is now full steam ahead for the LNG project, after sales and purchase deals with LNG buyers and project financing arrangements were completed in 2014. The first shipment of liquefied natural gas was completed on 25 May 2014, a historic moment for the project. The Spirit of Hela departed PNG carrying the first cargo, which was delivered to the Tokyo Electric Power Company Inc. (TEPCO) in Japan. The investment for the initial phase of the project, excluding shipping costs, was estimated at US$19 billion. Over the life the project it is expected that over nine trillion cubic feet of gas will be produced and sold. Plans to expand the plant are underway, with completion set by no later than the end of 2017. Within the next decade, Papua New Guinea expects to see the development of large scale projects. These projects include: Frieda Copper, Wafi/Golpu Copper, Yandera Copper Molybdenum, and Mt Kare Gold. There are also plans for a host of other alluvial mining projects. The Frieda River in Sandaun Province could potentially be the world's largest copper and gold depostis. Newcrest and Harmony Gold's Wafi-Golpu deposit in the Morobe Province is also showing great prospects. In December 2014, Newcrest and Harmony approved stage one of the Golpu project to proceed to feasibility study following the completion of an updated 2012 Golpu pre-feasibility study. During 2015, work will continue on updating the 2012 study, with completion expected by December 2015. These results have been achieved through an industry/government co-operative effort to revitalise the industry. Initially to rebuild and expand the exploration sector in the country, the efforts have expanded to establish a new suite of resource developments based on this renewed exploration. In both the mineral and petroleum sectors, there has been substantial growth in exploration expenditure in recent years and a corresponding significant increase in the number of exploration tenements. Foreign investors interested in the mining and petroleum sectors should note that the PNG Government has established a series of special administrative procedures which correspond to the stages of project development. The Government has also instituted measures to aid and boost the development of mining and petroleum projects. Overseas investors will find that there are numerous opportunities for profitable investment in PNG. The country's enormous and largely untapped resources offer excellent prospects, while the limited manufacturing base provides opportunities for investors to establish medium and small scale ventures in an uncrowded business enviroment. The PNG banking system is made up of the central bank (Bank of Papua New Guinea), and a number of commercial banks: Bank South Pacific, ANZ, Westpac, and Maybank. There are also a small number of finance companies and the National Develpoment Bank of PNG which provide finance to PNG enterprises for agricultural, industrial, and commercial projects. Other financial institutions include savings and loan societies and larger government owned superannuation funds. The Small Business Development Corporation, assists small- and medium-sized local businesses to secure finance and to operate efficiently. Finance is available from the banking system in PNG. However, overseas investors are unlikely to secure substantial funds locally, new operations would normally need to bring funds from overseas to establish a project, in which case the central bank generally requires a debt to equity ratio of 5:1. Exchange controls are applied in PNG and are administered by the Central Bank. These controls are applied to protect the country's reserves. Approval is readily given for the repatriation of after-tax profits of foreign-owned enterprises. Other current account payments for legitimate business reasons generally present no problems. Business may be carried out in PNG in a number of legal forms. These include sole traders, partnerships, private companies, public companies, branches of foreign companies, joint ventures, business groups, and trusts. Each type of business organisation is subject to particular regulations. Foreign investors usually establish a private, public company, or a branch of a foreign company. Before commencing business in PNG, it is necessary to incorporate a company or register as a branch of a foreign company under the Companies Act. This is generally a simple formality. An overseas company seeking to establish in Papua New Guinea would either: incorporate a subsidiary in PNG, or register as a foreign company in PNG. A company incorporated in PNG is required to have two directors, one of whom must be resident in PNG. A foreign company registered in PNG is required to appoint an agent who is resident in PNG. Each company carrying on business in PNG must be registered with the Registrar of Companies. It is also necessary to register business names. There is a large pool of labour in PNG. The wage rates are low by developed country standards, and productivity continues to improve as training of the people progresses. Although the skills of the local workforce are being upgraded, many new ventures, particularly those requiring technical know-how, still rely on some contracted foreign managerial and supervisory staff. PNG is producing world-class tradesmen; PNG airline pilots are sought from all over the world for their experience in flying over the rugged mountainous regions of the country. While recognising the legitimate need for overseas personnel for some new ventures, the Government of Papua New Guinea also insists that there is concurrent training of the local people to allow Papua New Guineans to eventually assume more responsibility in the workforce. Before employing expatriates a business must submit a plan to the Department of Industrial Relations outlining the training to be given to PNG staff. Once the requirements are satisfied a new business should face no problem in obtaining work permits for expatriates. PNG has preferential access to a number of overseas markets. Products of PNG origin are allowed duty free access to Australia, New Zealand, and the European Community under the PATCRA and SPARTECA agreements, and the Lome Convention (subject to local content currently 50% Patcra, 25% Sparteca). Papua New Guinean products also have preferential access to numerous other developed countries including Japan and the United States of America under the GSP system. The National Government assists its local producers with export potential. Papua New Guinea has commercial representatives located in Australia and Europe, while PNG's diplomatic representatives in other countries can help to bring about greater foreign market awareness and demand for PNG products. Foreign investors can lease land from the government for particular projects. The Industrial Centres Development Corporation (a government statutory authority) leases land and factory space for industrial purposes. There is currently a developed industrial centre near Lae, another near Kokopo in ENB, with two more planned for other regions in PNG. Investors involved in manufacturing operations will usually face no difficulties with land availability (depending on region). The Government will assist investors in large projects that are vital to the economic growth of the country, it has the right to do so under the Land Act. Nonetheless, the Government is generally restricted to protecting traditional property rights and investors will not be allowed to negotiate directly with the local owners. If handled properly, with the Government's involvement, the experience of other investors has shown that mutually satisfactory agreements can be readily developed. The Investment Promotion Authority (IPA) is responsible for the promotion, facilitation and certification of foreign investment. The IPA has significant private sector participation and a number of its staff has been recruited from the private sector. For projects not in the resource sectors, the IPA can assist with Government approvals for new ventures. Certificates are usually issued within three weeks. Foreign investors in resource-based ventures are also required to follow the laws of the government departments specifically responsible for the resource. These relate to investment in the mining and petroleum, agriculture, livestock, fisheries, and forestry sectors. The Department of Commerce and Industry is responsible for investment policy issues in relation to the manufacturing sector. The Department of Finance and Planning provides guidelines and assistance on monetary financial aid related matters. The Government of PNG has identified certain business activities which are restricted to citizen enterprises (100 percent citizen-owned) and national enterprises (more than 51 percent owned and controlled by PNG citizens). The list of reserved activities is reviewed regularly in order to keep in step with the requirements of the needs of the people. The Government in 1995 flagged it's intention to "phase out" the reserved activities list and investors are advised to seek further information from the IPA for latest developments in this regard. Further information can be found by visiting the IPA's website. The legal system in PNG is based largely on the Australian legal system which, in turn, has its roots in the English legal system. Court hearings are held in English and the law is applied fairly. The final court of appeal in PNG is the Supreme Court of Papua New Guinea. Despite the generally in-hospitable terrain in PNG, the Government continues to allocate priority to the development of a solid infrastructure. The principle modes of transport are air travel and sea freight. International flights are handled at Port Moresby and Mount Hagen airports. Air Niugini operates regular services to several Australian cities as well as to Singapore, Philippines, Japan, Europe, and the Solomon Islands. Flying time to Australia ranges from one hour (Cairns) to four hours (Sydney), while Singapore is just six hours away. The rugged mountain ranges on the mainland have inhibited the development of an extensive road network. There is no major road linking Port Moresby with the rest of the mainland but an important highway links the industrial city of Lae to the highlands towns of Goroka and Mount Hagen. As the national highways system is discontinuous, there are many internal flights to other towns which cannot be reached by mini buses, known locally as PMVs. Internal air transport is provided by the national airline, Air Niugini, PNG Air, and a number of other privately owned airlines. Reliable air services are available to all the main population centres. Most airlines offer freight facilities on their flights. International shipping lines operate regular freight services to and from Europe, Japan, South East Asia, the South Pacific, Australia, and New Zealand. Coastal shipping services are comprehensive, employing almost 250 vessels, some of which are containerised. These ships operate between the 17 ports along the coast line of the mainland and the islands. There are very good facilities for medium and small scale industries in and near the main towns. These areas are generally well served by roads, water, power and telecommunications facilities. The Industrial Centre Development Corporation (ICDC) manages a 27-hectare industrial centre near Lae, known as the Malahang Industrial Centre. The centre provides an ideal situation for new manufacturing operations with services of the centre. The telecommunications system is run by a government body, Telikom PNG, and is highly developed. Direct dialing is available to almost all parts of the country and, with the assistance of the solar powered microwave transmitters, is very effective. International direct dialing is also available from all centres. Facsimile, email, and postal services, both domestic and international, are also very efficient. Two mobile telephone networks operate in PNG: B-Mobile Vodafone, owned and operated by the government of Papua New Guinea, and Digicel, a network carrier which commenced operations in 2007. Both networks currently cover the main and surrounding centres of Port Moresby, Lae, Madang, Mount Hagen, Goroka, Rabaul, Kokopo, and East New Britain. Further network coverage is ongoing and is continually expanding. Visitors travelling to PNG with their own (unlocked) mobile phones can purchase local network SIM cards, and phone credits very easily from either network provider. Prepaid phone cards are readily available for purchase for use on public & private phones. Wireless internet is available at most major hotels. You may need to buy a pre-paid wireless Internet card to utilise these services. Check with your hotel for details. There are six main universities in the country. The largest institution, the University of Papua New Guinea, is based in the National Capital District (NCD). It offers various degrees to national and international students. The language of instruction in most universities is English. The two other main universities are the Papua New Guinea University of Technology based just outside of Lae, in Morobe Province, and the University of Goroka in the Eastern Highlands Province. Cholera and yellow fever inoculation certificates are not required when entering PNG, but if travelling from an infected area it is advisable to have a certificate. Malaria is a common health problem in PNG and is endemic in many parts of the country. Visitors are advised to undertake a course of malaria tablets prior to, during and after visiting the country. Passports are required of visitors of all nationalities. Visas are also required. All visitors must possess return or onward tickets and suffcient funds to support themselves whilst in PNG. For Australian visitors, visas are available on arrival in Port Moresby. When travelling to Papua New Guinea. Visas must be obtained before you enter the country. You will need travel documents, sufficient funds for your stay in PNG, and an airline ticket with confirmed outbound flights before the expiry date of your intended visa. As some restrictions apply to several Asian, Eastern European, and African countries, please check with the nearest Papua New Guinea Mission, or consular office, if a visa is needed before your arrival into PNG. You must apply for you temporary visa from your nearest visa issuing office. The currency used in Papua New Guinea is the PNG Kina (K). The Kina is available in denominations of: K1, K2, K5, K10, K20, K50, and K100. The currency is further divided into 100 toea. Daily exchange rates are usually listed in banks, newspapers, and hotels. Exchange your money at Jackson's Airport or at most banks, which are open from 9:00am to 5:00pm Monday - Thursdays and 9:00 - 3:00pm on Fridays. Contact one of PNG's operating banks for details if your currency is easily exchanged. Credit cards are accepted in leading hotels and shops. Travellers cheques and international credit cards are accepted in major hotels and restaurants. All items purchased in Papua New Guinea are subject to Value Added Tax (VAT). The amount of VAT is 10% and is usually included in published prices. Drugs, pornographic literature or video tapes, firearms, and weapons are prohibited. Food items, seeds, spices, live or dry plants, animals, animal products, and biological specimens such as cultures and blood need special import approval. For more information on customs procedures and services visit the PNG Customs website (www.customs.gov.pg). The export of alluvial or unworked gold is not permitted except through a licensed gold exporter on permit. The penalties for smuggling gold include: forfeiture, a fine, and imprisonment. The National Agriculture & Inspection Authority can provide information on what is permitted into the country. Excellent quality hotels are located in most large towns. Most hotels operate airport shuttle services. Make travel arrangements with your hotel prior to your arrival in PNG. Taxis can be unreliable in PNG. Visitors usually find it more convenient to hire a self-drive or chauffeur-driven car, particularly if a busy appointment schedule is expected. From deep sea fishing to calm and relaxing river fishing, PNG has its share of fishing challenges to lure any sport fisherman away from his or her usual haunts. Marlin, tuna, swordfish, as well as reef fish will keep the sea fisherman entertained for hours. PNG has a number of high standard fishing lodges and resorts tailored to meet the needs of many seasoned fishermen. Diving in PNG has been voted number 1 consecutively for several years by international dive magazines. The coral reefs teem with marine life of all shapes, sizes, colours, and descriptions. Whether it is the anemone and its clown fish, shark, dolphin, turtle, or lion fish, you will get a chance to see them all in PNG's crystal clear waters. The PNG Dive Association regulates its dive operations to ensure standards in safety are maintained. For a truly unique experience arrange to be in country during one of the many traditional festivals, or Singsings. These are events that bring together a celebration of culture, tradition, music, and colour. For example, the Hiri Moale festival, held in September in Port Moresby, is a celebration of the trade between the Motu Koitaban people of the central coast, the Kerema, and Gulf people. If given an opportunity, festivals such as the Morobe Show, Enga Show, Goroka Show, Mask Festivals, and Canoe Festivals should also be experienced. Port Moresby, the capital and largest city in Papua New Guinea, was named after Captain John Moresby who charted the coastline in 1873. The city is located in an area called the National Capital District or NCD and is located on the southern coast of the country. The city originally started as a mission station at Hanubada, a traditional Papuan Village and home to the Motuan people. Overlooking the superb natural Fairfax harbour, Port Moresby is the centre of business and government for PNG, and the countries major port. During the Second World War, the small town of Port Moresby was transformed into a large military camp accommodating thousands of troops during the Pacific campaigns. At the end of the war Port Moresby was the only town of any size left standing in Papua New Guinea and was chosen to be the seat of the government. This was the beginning of the urban drift that brought people from almost every tribal group of Papua New Guinea to the city as well as attracting a large population of foreigners. It is now a truly bustling cosmopolitan city with a population of around 400,000 residents. It is a blend of old and new. Small remnants of the colonial days can still be found in downtown Port Moresby and elements of traditional life have been maintained in the nearby villages. The city of Port Moresby is the gateway for virtually all international travellers to PNG. Jacksons Airport is a modern international facility located just 10 - 15 minutes drive from the city centre. It is the hub of the country's domestic air services, with connecting flights to all major centres and the hundreds of smaller provincial airfields scattered throughout the country. Vision City Mega Mall is a must if new in town, it is by far the largest shopping centre in the country. Here you will find everything you need for shopping, fashion, home furnishings, electrical or electronic goods, health, and beauty. The Megamall is also host to some of Port Moresby's best restaurants offering a wide range of menu choices. This is a haven of greenery with 2 km of boardwalk threading beneath a jungle canopy. Take a stroll through green lawns to see the excellent wildlife displays and huge collection of orchids. A shade house in the shape of the country has plants from all regions. Located just beyond the University of Papua New Guinea on Waigani Drive. Entrance fees apply. Thousands of young Australian and Papua New Guinean soldiers are buried in this carefully tended WWII cemetery. It is a heart-wrenching reminder of the horrific campaigns waged in the region. Located off Sogeri Road, near the Pacific Adventist University. Contact the cemetry on (675) 328 1536. The Hiri Moale Festival celebrates the epic voyages of the seafaring Motuans who journeyed to the Gulf Province on the famous seavessel, the "lagatoi." The festival is not just a celebration and showcase of Motuan culture, but involves other tribes whome the Motuans traded with throughout their history. The Hiri Hanenamo contest is a popular attraction at the festival, where young Motuan women vie for the coveted "Hiri Queen" crown. The festival is celebrated on Independence Day along Ela Beach. Port Moresby has the best nightlife on offer in the country. There is no shortage of things to do at night time. Many private restaurants are scattered throughout the city. Whatever cuisine you are after, Port Moresby is sure to offer it. The Royal Papua Yacht Club is also a great venue to visit; a large modern building overlooking a superb marina. Keep in mind that you will require a member of the club to sign you in as a visitor. For a night out on the town, Port Moresby can cater to your tastes. A popular venue for music, live performances, and fireworks displays, is the Gold Club located at the Lamana Hotel. Nearby, at Vision City Mega Mall, is the Cosmopolitan Night Club. PNG's premier superclub, this large venue offers two levels of premium entertainment. Other venues to consider are: Pondo Bar (located in the Crowne Plaza), the Penthouse, Port Moresby Country Club, and Ozzie's Bar. Only 46 km from Port Moresby is the Sogeri Plateau. At 800 m the air is cool and pleasant. This is also the starting point for the famous Kokoda Trail. Nearby is the Varirata National Park. Covering an area of 1,000 hectares, it was the original hunting grounds of its tree-house dwelling landowners. The Kokoda Trail or Track is a single-file foot path that runs 96 km through the Owen Stanley Range. The track is famous for being the location of a fierce battle between the Japanese and Australian armed forces during WWII. The track is notoriously difficult and has resulted in some deaths, which has prompted the Kokoda Track Authority to empose stricter guidelines for guides operating in the area. The Kokoda Track Authority requires tour operators to hold a Commercial Operators Licence to lead treks along the Kokoda Track and purchase a trek permit. A list of licensed operators is available on its website. This pleasant retreat from Moresby is great for a day visit or a weekend getaway. It lies off Bootless Bay and offers diving, snorkelling, fishing, sailboarding, or just the opportunity to relax away from the hustle and bustle of the city. Bootless Bay is about 20km from Moresby, reached by turning left at Six Mile and following the Magi Highway. The resort ferry leaves the Tahira Boating Centre at 8:30 and 15:30, or 17:15 on Fridays. Call (675) 325 8590 or visit the website for more details. The Morobe Province curves its way around the tropical blue waters of the Huon Gulf taking in the mountainous Huon Peninsula and the superb Markham Valley, with its tropical bird life, butterflies, and orchids. The Morobe Province is truly a beautiful part of the country with breathtaking scenery. The Province may well be the birthplace of the first human settlement in Papua New Guinea. Axe heads found at Bobongora have been dated at 40,000 years old. It is believed that the early coastal settlements were flooded by rising sea levels after the last Ice Age, effectively destroying most of Papua New Guinea's prehistoric artifacts. It was the discovery of gold at Wau in 1926, which sparked off the growth of Lae establishing itself as the headquarters for aviation companies which carried supplies to the miners in the search for gold. Aviation in pre-war Papua New Guinea was then centered almost exclusively in Morobe District. Guinea Airways carried more passengers and cargo and flew more passenger/cargo miles than were flown by any other air operators anywhere in the world for a 12 month period from 1929 to 1930. Lae's importance as a deep water port attracted the Japanese in securing Lae as a strategic base in World War II. There is a well-tended cemetery and fine memorial to those Australians who fell in defense of what was then the Australian territory of New Guinea. It was also from Lae that in 1937 the pioneer American aviator Amelia Earhart took off on one of the final legs of her round the world flight. She never completed that journey, and Lae was the last place to bid farewell to the famous adventurer. Morobe Province Province has, for many years, been somewhat of a hidden gem with respect to tourism promotion in Papua New Guinea. Its capital city, Lae, was known more for being the gateway to the highlands region and the industrial centre of the country rather than a tourist attraction. Things have changed: it now seems that the city and the province have been hiding its potential tourism light under a bush. Today, Lae has grown to become Papua New Guinea's second largest city and is both the administrative and business capital of the Morobe Province. It is the nation's major manufacturing and shipping centre. The Province has twenty wharves and a healthy coastal shipping industry. The Morobe Provincial government is very much aware of the vital role this province plays in trade and industry within Papua New Guinea. Consequently, it has encouraged investment in both the commerce and industry sectors. Many companies operate their head offices from Lae. Lae is an attractive tropical city well serviced by department stores, banks, travel agencies and an infrastructure of small traders and speciality craft and artifact outlets. It is also the site of the Papua New Guinea University of Technology (Unitech), which houses the Matheson Library, the largest technological library in the South Pacific. It has a large public exhibition of rare and valuable artifacts. In its promotion of tourism, the province is concentrating on the values of its natural attractions, eco-tourism, and its historical appeal. Modern day Lae is an attractive tropical city, well serviced by department stores, banks, travel agencies, and an infrastructure of small traders, speciality craft stores, and artifact outlets. Lae now boasts several major hotels that have every facility of any major luxury tourist destination in the world. There is lots to see and do. Lae is the base for so many attractions in and around the area. Part of the province is too rugged for any sort of major cultivation, as much of the region is covered in lush tropical rainforest. However, the province as a whole does lend itself quite well to a variety of agricultural activities, from cattle-ranching in the grassy pastures of the Markham Valley to copra, cocoa, and tea plantations. Other cash crops include the cultivation of cardamon and chillies. Lae has a tropical humid climate which makes it perfect for its vast variety of orchids. The temperature usually ranges between 24°C and 32°C although during cooler, wetter months the temperature can drop below 20°C. The annual average rainfall of 482 mm occurs mainly in the cooler months from May to September. The average maximum temperature is 32°C. The hottest and most humid time of the year begins in September and ends in May. Morobe Province is unique to Papua New Guinea as it spans from the mountains to the sea; enriched with so many different iconic cultures, archeological finds, and internationally acclaimed conservational attractions like that of the leatherback turtle and Mitchie's Tree Kangaroo. The province also includes a number of volcanic islands between the Huon Peninsula and New Britain. Morobe Province is a region of immense cultural and geographical diversity. From the reef-fringed tropical islands to the rugged inland Highlands, Morobe is as unique as it is diverse. There are nine districts within the Morobe Province, it consists of Lae, Huon, Wau-Bulolo, Markham, Menyamya, Nawaeb, Kabwum, Finschhafen, and Tewai-Siassi. Each District is unique to the other,ranging from the mountains to the sea. The population of Morobe is approximately 670,000 and they speak over 100 distinct languages. The people are as distinct and varied as the surroundings they live in. Morobeans are notably friendly and courteous people whom are eager and enthusiastic hosts to any newcomer to their environs. The province has a legacy of battlefield relics from the Second World War, ranging from submerged shipwrecks to aircraft and artillery. Notably many of the districts in Morobe have war scars and relics from WWII. These areas are infamous by their battle sites and treks. Along the Huon Coast also are battle sites where many Japanese forces have fallen these places are frequented by their families who have lost loved ones in those areas. 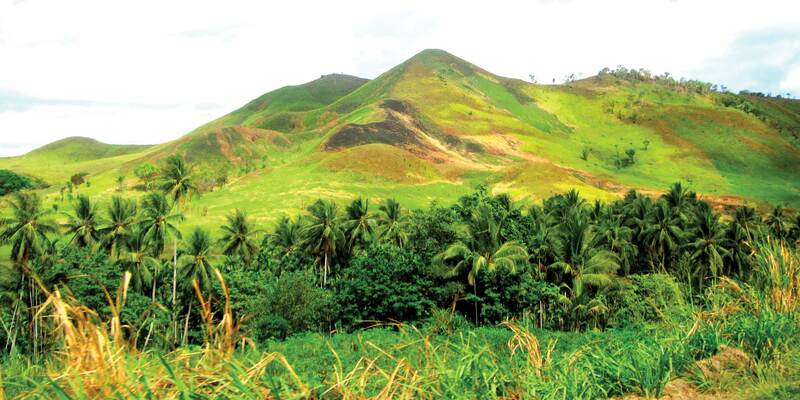 Salamaua is rich in historical heritage - it was the location where the gold rush into the Bulolo region began. Salamaua was a major base for the Japanese Imperial Army, this is evidenced by the existence of Japanese guns in the area. Several wrecks from WWII still remain close to the Salamaua coastline. Salamaua has to be one of the best kept secrets of this world and one of the most idyllic places ever to be. Various tracks in Salamaua are remnants of the gold rush era and the Japanese occupation during World War II. One of these tracks, the Black Cat Trail is recommended for experienced and adventurous trekkers. It starts from Wau to Salamaua in Morobe Province. It is one of the historical tracks in PNG that was used before and during World War II. The track is at a raw stage and is one of the toughest but adventurous tracks. Some of the bloodiest battles between the Japanese Imperial and Allied Forces were fought during the WWII along the trail. The scars of WWII still remain along the track. Live mortars, munitions, plane wrecks, clothing and huge bomb craters that are now filled with water are everywhere to be seen. Trekking the Black Cat should take four to five days. It is a gruelling 8-9 hours walk each day, but well worth the effort when greeted by villagers with such kindness and hospitality. Every stranger's safety is every villager's concern. There is very little influence by the outside world as the people who live along the track still value and maintain their traditional ways of life. There is an abundance of wildlife and also magnificent flora and fauna. For more information vist www.pngtrekking.com.pg. One of the annual highlights is the Morobe Show. Held on the weekend closest to the full moon in October, the show is the premier venue in Papua New Guinea for some of the best traditional dancing. The dancing groups ("Sing Sing Grups") perform at the show on the sunday following the official opening of the show. The Morobe Provincial Agricultural Society organises the show each year. Between 2,000 and 3,000 performers usually attend the show, providing entertainment for visitors. The show is scheduled for 15 - 16 October 2016. More information can be found on the organiser's website. The Lae Yacht Club was formed in 1961 and has become PNG's leading exponent of game fishing. The club offers state-of-the-art facilities in a superb location with stunning harbour views. More information is available on their website. The Rainforest Habitat is home to the largest variety of Birds of Paradise kept anywhere in the world. Located on the grounds of Unitech, the habitat draws many tourists from around the world. More information is available by contacting them directly by phone (+675 475 7839) or email. You can get additional information about tourism in Morobe Province, by contacting the Morobe Tourism Burea by phone (+675 472 7823) or email. The Eastern Highlands Province is one hour flight north from Port Moresby. During WWII the Eastern Highlands were used as a rest centre and vegetable producer for the troops stationed there. Located at the beginning of the Highlands valleys at an average height of 1,600m, the Eastern Highlands occupies the valleys of Lamari, Asaro, Wahgi, Tua, Dunatina and Ramu rivers. The common feature of this province are the steep rugged mountains covered in dense rain forest graduating to sub-alpine vegetation. The valleys are covered in grass and offer a breathtaking panorama of every shade of green imaginable. The population of the Eastern Highlands is approximately 580,000, speaking twenty distinct languages. The climate in the Eastern Highlands has often been referred to as the "land of eternal spring." The nights are cool and the days warm with an average high temperature of 28°C throughout the year. The lowest recorded temperatures are around 12-15°C at night time. The highlands truly have a wonderfully temperate climate. Goroka, the Eastern Highlands largest town and itscapital was established in 1939. The district is well known for its surrounding coffee plantations, rich diverse culture, and colourful flowers. Goroka is also home to one of the country's major educational facilities, the University of Goroka. Kainantu, popularly referred to as the "gateway to the highlands" is the second largest town and is situated on the highlands highway, 200 km from PNG's second largest city, Lae. Kainantu is also a major coffee growing area that also supports cattle grazing, poultry, and gold mining. It is the home to the country's coffee research institute at Aiyura. Goroka is one of the most appealing towns in Papua New Guinea. The JK McCarthy museum, located five minutes from the airport, is an ideal place to start your visit for a historical briefing on the provinces growth and early beginnings. Be sure to make a visit to the Goroka market where you will be amazed at the array of freshly grown vegetables and fruits. The Mt. Kiss lookout is breathtaking, so is a full-day nature walk in the Mt. Gahavisuka provincial park. Mt. Gahavisuka park is a wildlife sanctuary, situated on 28 ha of land and only 30 minutes by road from Goroka town. The Highlands of Papua New Guinea are the most densely populated areas of the country, it is divided into five separate provinces: Eastern Highlands, Simbu, Western Highlands, Enga Province, and the Southern Highlands. This extensively mountainous area provides the watershed for some of the world's largest river systems: the Sepik, Strickland and Fly Rivers all originate from this area. Europeans did not discover the highlands until the 1930s when the push for new gold began. Until that time it was believed the inhospitable terrain held no human habitation. Mt. Hagen is located towards the western end of the Wahgi Valley at a height of just over 1,600 m above sea level around the region there are mountain ranges that range in height between 2,000 to 4,000 m. Mt. Hagen is the administrative headquarters of the Western Highlands Province, and has evolved to become the principle commercial centre for the neighbouring provinces. The town is connected via the Highlands Highway to the towns of Kundiawa and Goroka, from here the road winds down to Lae in the Morobe Province, PNG's second largest city, and further to the North the picturesque town of Madang. Being the third largest city in PNG, it provides a good range of services including a large selection of trade stores, supermarkets, banks, pharmacies, business stationery suppliers, post office, and government offices. Mt Hagen was named after a German administrator Kurt Von Hagen back in the 1890s; it has now evolved into a vibrant bustling town with an estimated population of around 40,000. The market run by the urban city council is the biggest in the country. The market is a meeting place for traders who come from all over the province to sell fresh produce and curios. It's a unique experience with market stalls displaying a huge selection of different fruits and vegetables, birds, and animals from the highlands. The men traditionally wear a long beard and the women wear an array of brillant scarves and carry their brightly coloured string bags. These bags are called "bilums" and are used to carry just about everything from new born babies to firewood. The Western Highlands is an important coffee and tea growing area, for the cultivation of these two major cash crops, Highlands farmers are highly skilled. Although, unemployment is high most people earn their income from subsistence farming. Market gardening is also very popular, with most villages producing more food than they require, as a consequence fresh fruit and vegetables are always plentiful. The hillsides and valleys are meticulously tended with a neat, almost patchwork regularity. The general scenery throughout this part of PNG is truly majestic. Located on the North Coast mainland Papua New Guinea, Madang Province consists of reef-fringed lowlands backed by some of the most rugged mountains in New Guinea, and offshore volcanic islands of Manam, Karkar, Long, and Bagabag. The town of Madang is situated halfway along the northern coastline in spectacular tropical surrounding. The area is world famous for its coral reefs and superb visibility - it is a diver's paradise, and has the reputation as one of the most beautiful provinces of the country. Madang is a peninsula with an abundance of parks, ponds and waterways, and a myriad of small islands around its deepwater harbour. Its warm, wet climate and fertile soil combine to produce luxuriant tropical growth, completing the picture of what is aptly referred to as the "Prettiest Town in the South Pacific". The Province is divided into six districts: Rai Coast, Madang, Karkar, Bogia, Upper Ramu, and Middle Ramu. The landmass is approximately 27,970km2 and has a population a little over 380,000. In addition to the predominance of coastal features, the province also boasts some of Papua New Guinea's tallest and most rugged mountain peaks and some active volcanoes. Madang has a large mix of 170 languages in all and has the potential to give a visitor a crash course in witnessing four typical PNG lifestyles. It contains island dwellers, coastal people, river's edge settlers and mountaineers. All of these people look quite similar except for some Simbai tribes who inhabit the foothills of PNG's central highlands. They are smaller in stature and are often described as pygmies. They number only a few hundred and are tucked away in the south west corner of the province, quite often off the beaten track, so much so that even their Madang brethren hardly know they exit. Karkar, the other large volcanic island of the province, is distinguished for having some of the largest and most fertile coconut plantations of the country. One can inspect copra production in all stages as you travel along the palm-shaded road round the island. Islanders, of course, are fish and seafood eaters. River people use the sago, which grows all round them in the swamps as their staple. Coastals are gardeners with a variety of rootcrops, a dozen kinds of bananas, plus papaya, guava, avocado, lemon, orange, mango, and nut trees. Coconuts, of course, are ubiquitous. Not only is the town of Madang picturesque, the handmade pottery of nearby Yabob and Bilibil villages is, of course, Madang Province's most distinctive product. Visitors can watch the entire traditional process right at the outskirts of Madang town. In the old days, earthenware pots were a treasured item of trade. The original Yabobs and Bilibils established trading routes along the entire coast to market large crockpots, jars, and saucepans. Carving in the province is restricted to Ramu River peoples, who probably assimilated it from their talented Sepik River neighbours. They chisel out small figurines and also carve the prows of their canoes. Throughout the Madang stores, in hotel lobbies and markets, there is a plethora of Sepik carvings of all sizes and shapes. The Visitors and Cultural Bureau, located in Haus Tumbuna, has information on things to see and do around Madang. They also house a small museum with displays of weapons, jewellery, musical instruments, and historic photographs. Visit their facebook page for more information, alternatively they can be contacted by phone (+675 422 3302) or email. The Madang Resort Hotel and Madang Lodge offer tours of their workshops and markets, where carvings, shell jewellery, and bilums may be bought. Visitors are also able to see the Elizabeth Sowerby Orchid Collection and a variety of other flowers at the hotel. Contact the Hotel for more information regarding tours and visits, or visit the resort's website for more information. The Kau Rainforest Museum, owned by the Didipa Clan is a small section of rainforest set aside to preserve traditional bush knowledge and offer environmental education. The rainforest is located about 20 km from Madang, off the North Coast Road. While in Madang, be sure to visit some of the picturesque islands. Kranket, Siar, and Samun all have accommodation to suit your needs. Alternatively, day trips can be planned where visitors can enjoy swimming, snorkelling, and picnics along the beaches. The islands of Manam and Karkar are home to active volcanoes rising 1,800 m above sea level. The smoking peaks offer spectacular views for visitors. The annual Mabarosa Festival is hosted in Madang. The festival is colourful display of dancing, "Sing Sing Groups", and bamboo bands. For more information contact the Visitors and Cultural Bureau. East New Britain lies between 4 and 6 degrees south of the Equator and was one of the first areas in PNG to be visited by early explorers and navigators. It covers a total land area of 15,816 km² with a tropical rainforest vegetation; most parts are covered with rugged mountain ranges. The estimated population of the province is 400,000 of whom the majority are Tolais. People who live in East New Britain are of Melanesian descent, speaking Austronesian languages of which there are sixteen. "Kuana" which the Tolais speak is the main language of the Gazelle Peninsula. Local government councils were established in the province during the Colonial Era. Between 1960 and 1970, these smaller councils were amalgamated into three large council areas, namely the Gazelle, Greater Toma, and Mangen. East New Britain attained Provincial Government status in 1976, with sixteen appointed members, in the first Interim Provincial Government. The IPG was later responsible for developing the East New Britain Provincial Government Constitution. The first Provincial Government was formally inaugurated on 13 July 1976. The people of East New Britain have been seen as culturely diversified, with rich and unique traditions. The "tumbuan" signifies spiritual dancers and traditional ceremonies that demonstrates a history well kept and used in today's society. The Tolai people of the Gazelle Peninsulla have continued to use the traditional shell money called "tabu." They use the tabu as a contribution to the Tolai male secret society of tumbuan and dukduk, for distribution to people at death ceremonies, as payment of a bride price, for settling disputes, to purchase land, or even garden food from local markets. The tropical nature of the province, with its evergreen rainforest vegetation and rugged mountain ranges, the imposing volcanoes which surrounds the town of Rabaul and the beautiful Simpson harbour have made East New Britain an attractive and adventurous place to visit. The marine resources are diverse and the tropical environment provides opportunities for bush trekking, mountain trekking, mountain climbing, and cave exploration. War wrecks also litter the surrounding reefs. The excellent visibility makes this an exciting dive spot all year round. Dive trips, day tours as well as charter boats for fishing can be organised through any of the accommodations or tour operators. Forty five minutes by boat from Kokopo are the Duke of York Islands, offering sport diving, snorkelling and picnics under the coconut trees. The lagoons around this historical group of islands provide all-weather canoeing, wind surfing, and water skiing and are a haven for visiting yachts. The economy of East New Britain consists of a dual economy where the modern cash economy operates side by side with the subsistence farming sector. East New Britain is now the leading cocoa producer in the country. Cocoa from the country is exported overseas to Singapore, the E.U., the U.S.A., the Philippines, and Malaysia. It is also the leading copra producer for exports. With the development of Kokopo as the new provincial administration headquarters of East New Britain Province and the new Regional Centre for the New Guinea Islands, a number of medium to large scale service industries such as supermarkets, retail stores and banks have been established developing services for locals and international visitors. The economy of East New Britain has been predominantly based on the agricultural sector. Cocoa and copra have been the main products of the province. Rabaul and the Gazelle Peninsula of the East New Britain Province are fascinating and unique places to visit by both people from other provinces and international tourists. Rabaul has been one of the more attractive holiday destinations, not only in the New Guinea Islands, but also in the whole of Papua New Guinea, due to its beautiful natural scenery, rich diversified and unique traditional cultures. The friendliness of the local people welcoming tourists who visit the province with broad smiles and waving hands, is also an attractive part of the area. The East New Britain Historical & Cultural Centre located in Kokopo across from the golf course, has several collections of historical relics and photographs on display. The centre is open daily and charges K5 for entry. More information is available by contacting the centre on (675) 982 8453. The Vunapope Catholic Mission is located at the eastern end of Kokopo. The mission offers a number of old colonial buildings to explore and boasts magnificent views. The Bitapak War Cemetry has the graves of more than 1,000 allied war soldiers. The grounds are well cared for and are also home to some gardens. There are still remnants of the Japanese occupation in PNG. Some 580 km of tunnels built by the Japanese are still open. The Japanese Barge Tunnels are also popular with visitors as they still contain five large barges lined end to end. It is recommended to bring along torches when visiting the tunnels. Malmaluan Lookout, another tourist favourite, offers views of the volcanoes surrounding Simpson Harbour. The lookout can be reached via Burma Road, off the Kokopo-Rabaul Road. The government of Papua New Guinea identified East New Britain, specifically Kokopo, as a hub of tourism. Government has made allowances in their budget to improve the infrastructure which will go a long way in improving the economy in the region.